Delivery of the 2014 World Cup stadiums was problematic from the start and proved even more so in the passing few months, especially with three of them suffering from significant blows. In Curitiba work was halted for safety reasons despite it being the most delayed stadium. In Cuiaba a spectacular fire consumed some of the infrastructure and finally in Sao Paulo the recent crane accident makes it impossible to even estimate delivery time. FIFA already confirmed these stadiums will not be delivered until the end of January (Cuiaba) or February (Curitiba) 2014. Sao Paulo's new timeline should be known by the end of the week as analysis is ongoing. No changes in opening game or venue list is planned, though. “We are in a period of time when the opening game of the World Cup will be played in Sao Paulo,” said Jreome Valcke, FIFA secretary general. “We are not in a crisis mood where we are looking for an alternative to São Paulo. We are confident they can deliver the stadium on time”. Yesterday three more venues were added to the list of delayed projects by sports minister Aldo Rebelo, though his announcement aimed at reassuring everyone they will be done in time to host the 2014 tournament despite lagging behind. Speaking on Wednesday, Mr Rebelo said: "There are delays but they will not be significant. What matters is that we are ready to go in January". 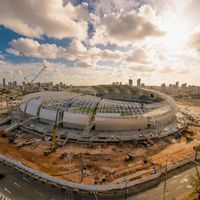 The three additional venues that will not be done within the next four weeks (but are beyond the 90% progress point) are Arena da Amazonia (Manaus), Estadio Beira-Rio (Porto Alegre) and Arena das Dunas (Natal).